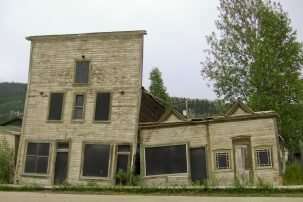 In Bethel, Alaska, walls are splitting, houses are collapsing, and the main road looks like a kiddy rollercoaster. In the coastal town of Kongiganak, sinking cemeteries prevent Alaskans from burying their dead in the ground. The village of Shishmaref, located on an island five miles from the western Alaska mainland, has eroded so much that it is contemplating total relocation. These communities are being plagued by permafrost that is thawing. Permafrost is ground that remains frozen for two or more consecutive years. It is composed of rock, soil, sediments, and varying amounts of ice that bind the elements together. Some permafrost has been frozen for tens or hundreds of thousands of years. Found under a layer of soil, permafrost can be from three feet to 4,900 feet thick. It stores the carbon-based remains of plants and animals that froze before they could decompose. Scientists estimate that the world's permafrost holds 1,500 billion tons of carbon, almost double the amount of carbon that is currently in the atmosphere. Unfortunately, when permafrost warms and thaws, it releases carbon dioxide and methane into the atmosphere. As the global thermostat rises, permafrost, rather than storing carbon, could become a significant source of planet-heating emissions. Permafrost is already thawing in some places, and if the problem spreads, scientists worry it could initiate a runaway process of global warming. Permafrost covers about 24 percent of the exposed landmass of the Northern Hemisphere—about 9 million square miles. It is found at high latitudes and high altitudes, mainly in Siberia, the Tibetan Plateau, Alaska, Northern Canada, Greenland, parts of Scandinavia and Russia. The continental shelves below the Arctic Ocean, which were exposed during the last ice age, also contain permafrost. However, polar and high altitude regions are some the most climate-sensitive places on the planet. The Arctic is warming twice as fast as the rest of the planet, at a rate of temperature change that has not been observed in at least the last 2,000 years, according to the National Oceanic and Atmospheric Administration (NOAA). In 2016, annual average surface temperatures were 3.5 degrees Celsius warmer than they were at the start of the 20th century. That year, permafrost temperatures in the Arctic were the warmest ever recorded. In Alaska, permafrost temperatures have warmed as much as 2˚C in the last few decades. A recent study projects that with every 1˚C increase in temperature, 1.5 million square miles of permafrost could be lost through thawing. O. Roger Anderson, a biologist at the Earth Institute's Lamont-Doherty Earth Observatory, explained why permafrost releases carbon as it thaws. The 'active layer' of soil on top of the permafrost, which may be two to 13 feet deep, thaws each summer and can sustain plant life. This layer releases carbon from the roots of plants that respire out CO2, and from microbes in the soil. Some microbes break down the organic matter into CO2. Others, called archaea, produce methane instead, when conditions are anaerobic—when the soil is saturated with water or no oxygen is available. Methane is 20 to 30 times more potent than carbon dioxide at exacerbating global warming, but it remains in the atmosphere for less time. As permafrost thaws, the active layer deepens. The microbes become active and plant roots can penetrate further down, resulting in the production of more CO2. The amount of methane generated depends on how saturated the ground is. Scientists don't know the relative proportions of carbon dioxide and methane emissions that might result from largescale thawing permafrost, said Anderson, because this has never happened in human history. However, research on the upper layer of the tundra (treeless plains overlying the permafrost) suggests that the average carbon dioxide emissions are about 50 times higher than those of methane. "And we know that for every 10 degrees Celsius that the soil warms up, the emission of CO2 will double," said Anderson. A 2017 study estimated that if global temperatures rise 1.5˚C above 1861 levels, thawing permafrost could release 68 to 508 gigatons of carbon. Without factoring in human activity, this carbon alone would increase global temperatures 0.13 to1.69˚C by 2300. Since we may have already locked in 1.5˚C of warming above pre-industrial levels, this amount of additional warming could result in catastrophic impacts of climate change. Although a warmer Arctic could support more plants, and plants absorb carbon dioxide through photosynthesis, the new growth is projected to offset only about 20 percent of the permafrost's carbon release. One thing that protects permafrost from the impacts of climate change is peat, the partly decayed vegetation that accumulates in water-saturated environments with no oxygen. Found in much of the low Arctic, peat can overlie or encompass the whole active layer or be frozen as permafrost. Ben Gaglioti, a postdoctoral research scientist at Lamont-Doherty Earth Observatory, studied lake sediment records in northern Alaska to determine how much carbon the permafrost released in response to warming periods at the end of the last ice age. It turns out that the permafrost was much more sensitive—meaning it released more carbon—during past warming events, with gradually less response over time. In the most recent 150 years of warming, there has been relatively little response. 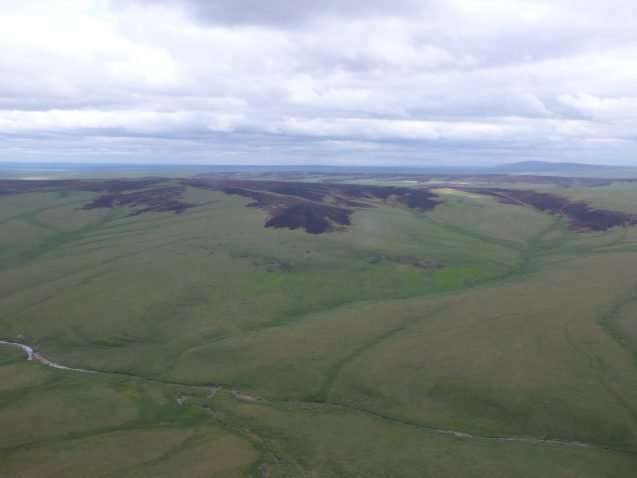 "Our hypothesis is that the buildup of organic matter or peat in the watershed has occurred because of a relatively warm and stable climate since the ice age," said Gaglioti. "That peat, which started accumulating around 13,000 years ago, does a great job at insulating the underlying ground from thaw, so we think it's buffering the permafrost." Gaglioti's models show that the sensitivity of the underlying permafrost is highly dependent on the thickness of the peat. "The fate of the underlying permafrost rests in some ways on the stability of the peat layer," he said. Wildfires can peel back the peat and make permafrost more sensitive to climate change—and they're expected to increase in tundra regions, Gaglioti said. Warmer and drier summers make vegetation more combustible. Warmer temperatures also bring about more thunderstorms and lightning strikes that can spark wildfires. Fires not only release CO2 as they burn; afterwards, the blackened ground absorbs more solar radiation and warms further. And once fire removes the peat and vegetation that shades the ground, the landscape can become too well-drained to regenerate the peat. 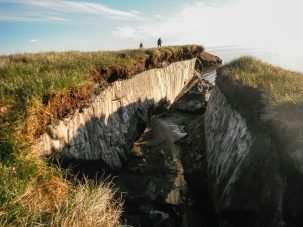 Many scientists are concerned that thawing permafrost could be a tipping point that triggers an irreversible cycle: When permafrost releases its carbon as CO2 or methane, it will accelerate warming, which will then precipitate more permafrost thaw, and so on. There will be nothing humans can do to stop it. The regions where permafrost is frozen year-round are already shifting northwards; and in some areas, the tundra now freezes later in the fall, allowing more time for microbes to decompose organic matter and for plants to respire. 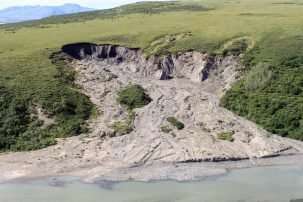 When the ice in permafrost melts, the ground becomes unstable and can slump, causing rock and landslides, floods and coastal erosion. The ground has collapsed 280 feet deep in some parts of Siberia. The buckling earth can damage buildings, roads, power lines and other infrastructure. It can also harm natural ecosystems. Thermokarst lakes—depressions formed when thawing permafrost collapsed and filled with meltwater—are important for wildlife and provide water to local communities. But if the underlying permafrost continues to thaw, lakes and wetlands can drain completely, destroying these biologically important resources. As the sediments from landslides muddy streams and lakes, they affect plant life at the base of the food chain and potentially all the creatures that depend on it. Changes in the landscape can alter caribou breeding and migration patterns. And as the Arctic warms, beavers are moving northward. Their dams flood new areas, creating boggy stretches that allow for more warm water to thaw permafrost further. 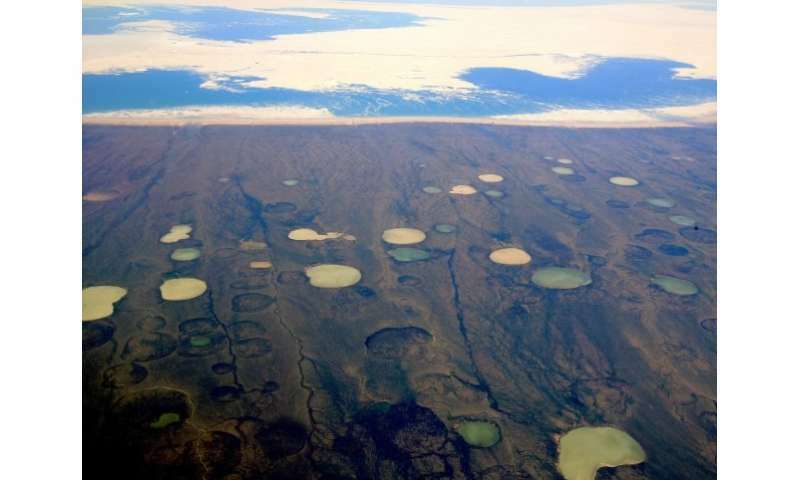 Thawing permafrost can release more than carbon emissions. In 2016, a young boy died and dozens were hospitalized after contracting anthrax on the Yamal Peninsula in Siberia. An anthrax-infected reindeer carcass that froze 75 years earlier became exposed when the permafrost thawed. Anthrax spores entered the soil and water, and eventually the food supply, infecting the humans. People and animals and their diseases have been frozen in the permafrost for hundreds of years, but bacteria and viruses can survive in permafrost for hundreds of thousands of years—scientists recently revived a 30,000-year-old virus that infects amoebas. Diseases like the Spanish flu, smallpox or the plague that have been wiped out might be frozen in the permafrost. As the Arctic warms, more activity, like mining for rare earth or precious metals, could potentially put us in contact with them again. Building on permafrost is problematic, not only because the ground is unstable, but because the heat of buildings and pipes themselves can warm permafrost. Structures must be built on wood piles or based on thick gravel pads. Water and sewer pipes must be placed above ground. Some Bethel roads and airport runways are outfitted with liquid-filled pipes that transfer heat away from the permafrost, and the hospital has installed machines that keep the ground constantly refrigerated. In Inuvik, a town in northwestern Canada, researchers are experimenting with new varieties of pilings to stabilize buildings, but they haven't yet found a perfect solution. They say it's hard to know what will work best because no one in the Arctic has ever experienced the rate of permafrost change that is occurring today. While the most recent Intergovernmental Panel on Climate Change's report acknowledged that permafrost is warming, its climate models did not account for these emissions when making climate projections. That's because ultimately, how much the planet warms from thawing permafrost will depend on how much carbon is released, how quickly, and whether it is in the form of CO2 or methane. But to get a fuller understanding of this phenomenon and to be able to make more accurate climate projections, scientists need to be able to better assess the vulnerability of permafrost to thawing and its many consequences for the Arctic and the planet. "Scientific research is so important in understanding," said Anderson. "We just can't predict from what's already known because we've never had permafrost thawing previously to this extent. It's only through more careful scientific research that we can answer these questions."